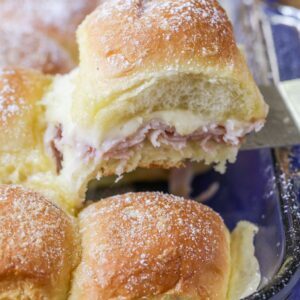 Monte Cristo sliders are the ultimate sweet and salty party food! Everything you love about a Monte Cristo sandwich - cheese, turkey, ham, and powdered sugar - but in appetizer form. Remove rolls from packaging, and without separating them, use a serrated knife to slice in half horizontally. Repeat with second package. Place both bottom portions of rolls side-by-side in a lightly sprayed, foil lined, 9x13 baking pan. Evenly layer ham, then turkey, then cheese slices over the rolls. Place the top portion of the rolls over the cheese layer. In a bowl, whisk together melted butter, egg and dijon mustard until well combined. Evenly pour over the tops of rolls, covering each one. Tent a piece of foil over the rolls, making sure the foil does not touch the tops of the rolls. Bake at 350 for 20 minutes. Remove foil and continue baking for 10 more minutes. Remove from oven and cool for 15 minutes before removing rolls from pan. Dust with powdered sugar and serve immediately.